EA Sports has been using its famous slogan, “It’s in the game,” for more than two decades now, touting how realistic its games supposedly are. But while the games may get closer to real life every year, you’ve never quite been able to pull off a Datsyukian move in one of EA’s NHL titles. This is particularly frustrating these days — the real-life NHL is more about speed, skill and finesse than ever, and that fast-paced action, well, isn’t in the game. EA Vancouver is hoping to change that this year in NHL 18, in an effort to allow players to do what the NHL’s brightest stars do every night on the ice. To hear the studio tell it, much of what’s new in NHL 18 was added to represent today’s league. Along with expanded control options on both offense and defense, the game will integrate three-on-three play through a new mode and the Vegas Golden Knights — the NHL’s newest team, which is announcing its initial roster tonight — through a major addition to the Franchise mode’s feature set. 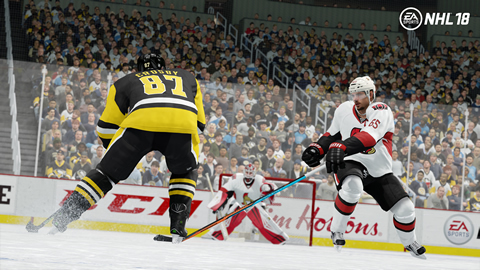 It’s a crucial year for EA Vancouver, as the studio puts a new three-year plan for the NHL series into effect. The developers have clawed their way back from a disastrous debut on current-generation consoles, but they haven’t yet been able to go much further. Will they get there with NHL 18? The new NHL is “all about the young stars,” said Sean Ramjagsingh, longtime lead producer on the NHL franchise at EA Vancouver, in a phone interview with Polygon last week. These days, teenage talents like the Edmonton Oilers’ Connor McDavid — who graces the cover of NHL 18 — and Auston Matthews of the Toronto Maple Leafs can come into the league and make an immediate impact as rookies. NHL 18 is about “giving fans the tools to be as creative as the players on the ice,” Ramjagsingh told Polygon. To that end, EA Vancouver is adding all kinds of new skill moves to the game, including one-handed dekes and the aforementioned Datsyukian puck flip. You’ll be able to chain those moves together, if you’re playing as an NHL star who is a skilled enough dangler. These kinds of moves will be accessible even for people who aren’t longtime fans of EA’s hockey franchise. Holding L1/LB and tapping a face button will initiate one of the deke animations; you won’t need fancy finger work on the analog sticks. Advanced players will be happy to hear that EA Vancouver is tuning the manual stick deking to provide a more one-to-one feel, based on feedback from fans who said they liked the responsiveness of deking in the franchise’s last-generation heyday. Defense in NHL 18 is also focused on giving you “full control of your stick,” said Ramjagsingh. Now you’ll be able to hold the R1/RB button and have complete control of your stick’s position. (Tapping it still does a poke check.) Simply holding the button will keep your stick in front of you, which is useful for deflecting shots out of play, and moving the right analog stick will let you sweep your hockey stick back and forth. Are you looking for forward to NHL 18 information? More NHL 18 News and Guides will update by Mmocs.com! Cheapest nhl 18 coins for you to build your NHL Ultimate Team.